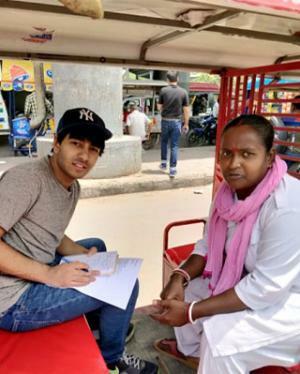 I interned at the Centre for Science and Environment (CSE), New Delhi, for a period of 3 weeks in April-May 2018 and researched on "Electric Mobility for Intermediate Para Transit.” My research was focused on Delhi’s non-polluting electric rickshaws (e-rickshaws). 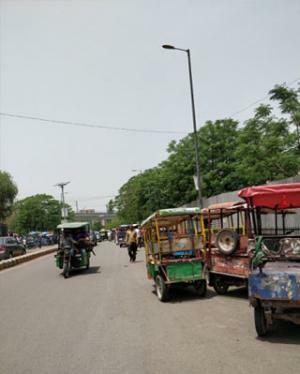 Here, I present a case study about e-rickshaws in Delhi based on my personal experience of witnessing this sector closely. The purpose of this study is to analyse the current situation of this sector, the problems it encounters, and the steps/strategies needed for its improvement. E-rickshaws are non-polluting vehicles. Replacing conventional vehicles (such as auto-rickshaws) with e-rickshaws can significantly improve the air quality in Delhi. The e-rickshaw system in Delhi is still in its nascent stage and needs a major improvement in infrastructure. There are no e-rickshaw parking stands or charging spots provided by the government. The drivers have limited income streams and say that they are only able to earn enough to survive. They are not allowed on the main roads and many a times, their vehicles are confiscated. 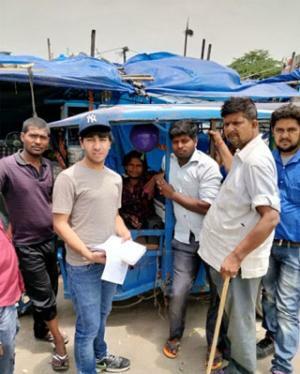 During my field work, I collated data by personally interviewing various parties: 22 e-rickshaws drivers, commuters travelling in them, the owner of a private charging station, and an e-rickshaw dealer (across 4 locations—Govindpuri, Harkesh Nagar, Jasola, and Sarita Vihar). Most of the drivers were men. I only came across one female driver. I asked each driver to rate his or her happiness with the current situation on a scale from 1 to 5 (1 being the least happy and 5 being the happiest). The average of all the drivers was found to be 3.23. Many of the e-rickshaw drivers felt proud of driving vehicles that did not contribute to air pollution. 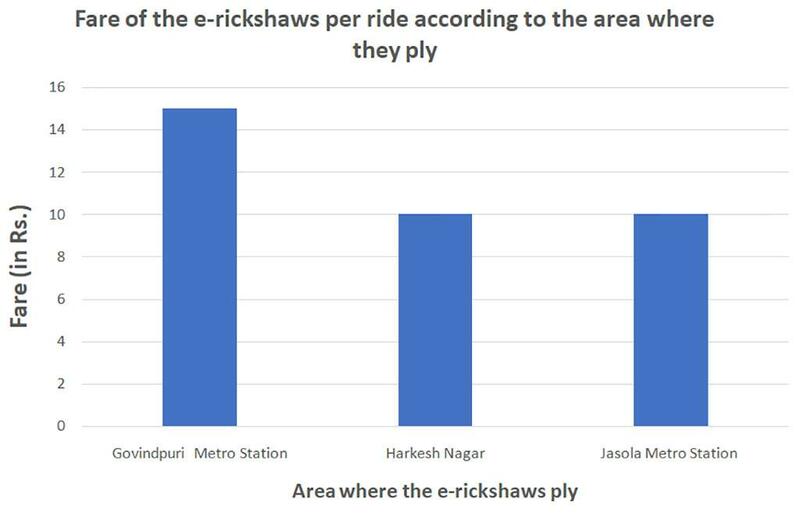 An interesting discovery I made from my study was that the situation of the e-rickshaw drivers at different locations was different, but the situation of e-rickshaw drivers at the same location was pretty much the same. This basically means that between two locations, the responses of a driver at one location would be different from the responses of a driver at the other location, but the responses of two drivers at the same location would be pretty similar. The fare of the e-rickshaw is decided according to the area and remains fixed in that area for all drivers. Unnecessary fines and confiscation of vehicles by regulators/govt./police. There are still no proper charging facilities set up by the government. 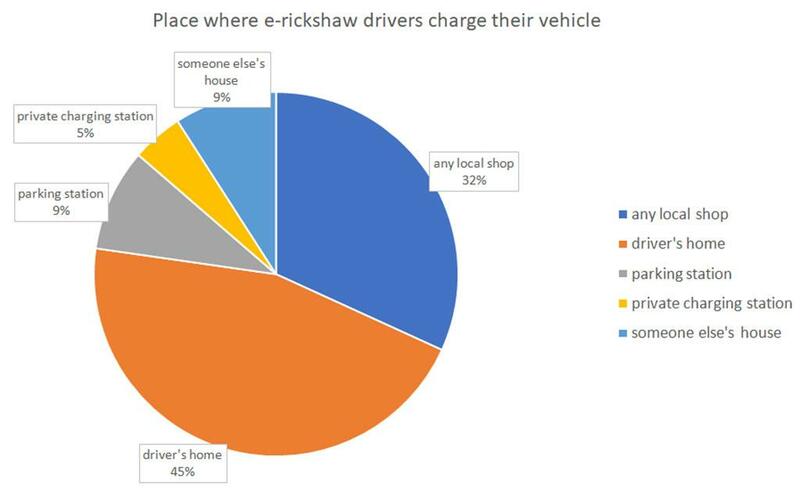 Out of the twenty-two e-rickshaw drivers interviewed, seven charged their vehicle at local food or goods shops and paid the owner of the shop on a daily or monthly basis. Eleven of the drivers charged the vehicles at their house with the available electricity. Two drivers charged their vehicles at a parking place, one charged at someone else’s house, and one charged at a private charging station recently introduced. Most of the drivers charged their vehicles twice a day, the entire night and a few hours in the afternoon during lunchtime. The cost of charging varied for the drivers of different locations. The cost is generally Rs. 120 a day for charging at a local shop and Rs. 30 a day for charging at one’s own house. 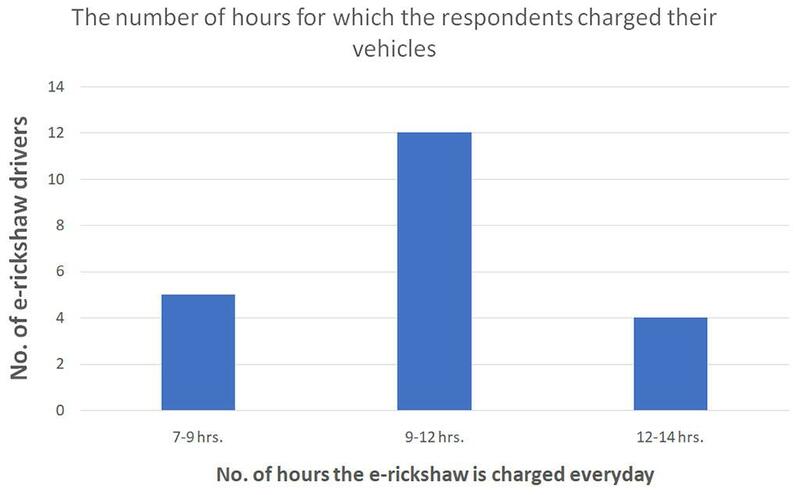 On an average, the e-rickshaw drivers charged their vehicle for 8-10 hours at night and 2-3 hours in the afternoon. This charge usually lasts for around 70 kilometres. 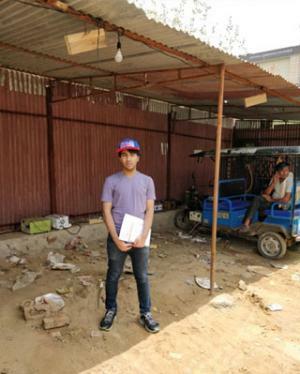 I interviewed the owner of the private parking station located in Jasola, New Delhi. 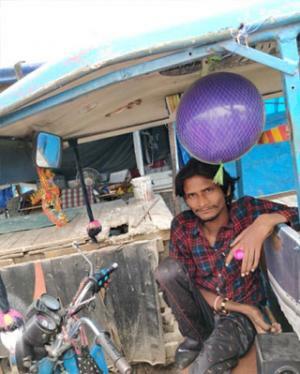 The owner, Vinod Kumar Bidhuri, has a large piece of land where he keeps one guard for the security and charging of the e-rickshaws. In the corner of his land, he has made a covered space with 50 charging spots for e-rickshaw drivers to charge their vehicles at Rs. 80 a day, for any number of hours. The e-rickshaw drivers generally charge their vehicle twice a day, for a total of 10-12 hours. 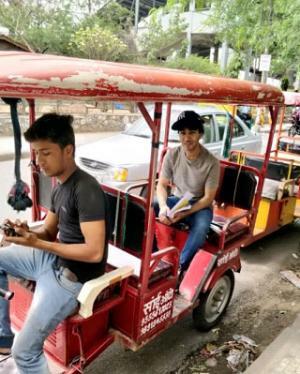 When asked about battery swapping, Bidhuri said he will be willing to provide such facilities to the drivers and wants to take initiatives to improve the situation of e-rickshaws in Delhi. In such a scenario, the government needs to introduce parking stands at the earliest to deal with the grievances of these drivers and improve the infrastructure for e-rickshaws. 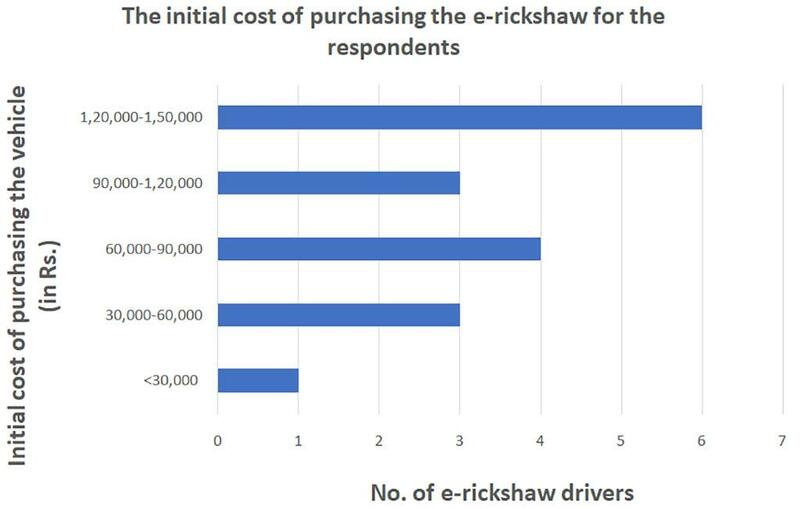 None of the e-rickshaw drivers were aware of the different kinds of battery options available in the market—lead-acid or lithium-ion batteries. On being told about the lithium-ion battery, most of them felt there wasn’t any point for the battery to be so expensive as none of them could afford it, even if it lasted longer. One of the drivers knew about a battery that lasted longer, but he didn’t know the name. Another one had some knowledge about super-capacitor charging. Very few drivers felt the high prices of the lithium-ion battery were justified, given its benefits. All the drivers sell their old battery to the dealer from whom they purchase the new battery. The dealer generally subtracts Rs. 8,000–Rs. 10,000 from the cost of the new battery when they give him the old battery. Thus, they need to pay around Rs. 15,000 and give their old battery to the dealer to purchase a new battery. The cost varies depending upon the brand. Almost all the drivers replaced their batteries after six months. There is a six-month warranty period for the battery. If the battery gets spoilt before this period, it is replaced free of cost by the dealer. The drivers are not too happy with the battery. They want a more efficient battery that lasts longer, needs less charging, and charges quickly. None of the e-drivers knew about the system of battery swapping. Nineteen out of the twenty-two drivers said they will be extremely happy if battery swapping is introduced. They only saw a benefit in battery swapping. Ten of the drivers said they would lower their fare if battery swapping is introduced, while six said they would improve their services by buying new tyres and painting their vehicle. One of the drivers was concerned about the constant replacement of the battery in the system of battery swapping and hence, did not support battery swapping. I questioned all the drivers about why they drove an e-rickshaw over an auto-rickshaw or a cycle-rickshaw. Almost all the drivers said that they couldn’t afford to buy an auto-rickshaw and hence, did not drive it. None of the e-rickshaw drivers wanted to ride the cycle-rickshaw as they found it extremely hard to ride. There was also a problem with obtaining a license for the auto-rickshaw. Furthermore, some of the drivers didn’t know how to drive an auto-rickshaw and felt that that they could drive the e-rickshaw even in very small lanes and were happy. The most significant challenges were related to the charging facilities, the parking facilities, and the traffic police. The charging infrastructure is weakly developed and needs enormous improvement. There are no proper parking stands, which causes serious concerns for these drivers, for example, having to sleep on their vehicles. The need of the hour is to introduce charging stations and e-rickshaw parking stands all across the city. The drivers say that the police frequently catch them and fine them. Sometimes even their vehicles are confiscated. The problem here is that the drivers are not told about the routes they are allowed to travel on and the routes they are restricted on. The routes for e-rickshaw drivers need to be increased and they should be properly instructed about these routes. The lady driver faced an issue with the male drivers. She said that there were three other lady drivers on the same route as hers. She said the male drivers sometimes used violence against her. The police should provide proper care for these lady drivers and look after their safety. When I spoke to the e-rickshaw dealer, he told me that he is able to sell only two or three e-rickshaws in a month. He felt a major cause of the low sales was the low amount of loan given by the banks and the high amount of the down payment needed for the purchase of the e-rickshaws. He told me that every month, at least 15 drivers couldn’t buy e-rickshaws as they did not have the money to make the down payment. He wanted the down payment to be reduced to as low at Rs. 20,000 and the loans to increase to Rs. 1,20,000. 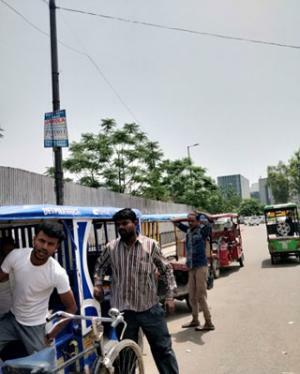 The e-rickshaws in Delhi play a significant role in enhancing last mile connectivity and are essential for improving the condition of our city’s air quality. However, there are still several loopholes in this sector and several initiatives need to be taken by the government to improve the sector. I wanted to commend you for your work. We as an organization conducted similar research and our findings were almost the same as yours. One thing that I would like to point out is that Swapping is not feasible with Lead Acid Batteries as it is too bulky and there are additional issue of acid spillage, loose connectors etc. Hence, swapping can be done with Lithium Ion only which as on now is in testing stage. You could also have mentioned regarding the subsidy of Rs. 30,000 offered by Delhi government to the drivers on purchase of an e-rickshaw. Great work and awesome report! We have been researching about the issues faced by the battery rickshaw owners for more than a year now. We have identified exactly the same set of issues that you have mentioned in your report. My company has come up with a solution for charging and by and large for battery problems. We have created a solar panel system specially made for electric rickshaws. On a fully sunny day our solar system has proven to run a battery rickshaw for more than 80 kilometers. Battery life is increased from 8 months to at least 24 months. Financing part still need to be figured out for the rickshaw owners. More details on our website www.SunRunMotors.com. Coincidentally, our company is based in Jasola/Sarita Vihar area in Delhi where we are currently manufacturing our solar system. 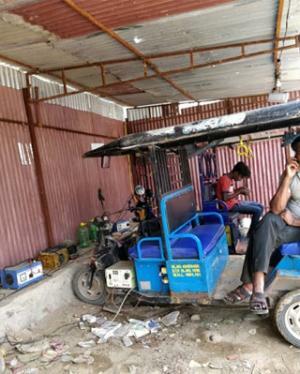 We have a battery rickshaw running with our solar system in Sarita Vihar area for the past couple of months. Hope to hear more from you on related topics.